Dubai, April 15: The United Arab Emirates (UAE) only Sikh temple will host iftar for workers throughout the upcoming month of Ramadan, the chairman of the Guru Nanak Darbar Gurdwara said. The Gurudwara in Dubai's Jebel Ali, which has been hosting an interfaith iftar during every Ramadan in the past six years, will offer the meals to workers in the area every day, Chairman Surender Singh Kandhari told Gulf News on Sunday. "There are a lot of Muslim workers in this area. There are not many places from where they can break their fast. We will invite these workers to have iftar from our Gurudwara." He said the free vegetarian meal (langar) offered to every visitor in the Gurudwara will be given to those visiting to break the fast also. "We will add dates, fruits, rose milk, buttermilk and some Indian snacks like pakora, samosa also for them. We expect to host 100 to 200 every day during Ramadan," said Kandhari. He was speaking after an official ceremony marking Baisakhi, the Sikh New Year, which was attended by top officials of Dubai's Community Development Authority (CDA). RSS Organises Iftar Party for The First Time in Mumbai, Muslim Politicians Suspect Vested Interests. 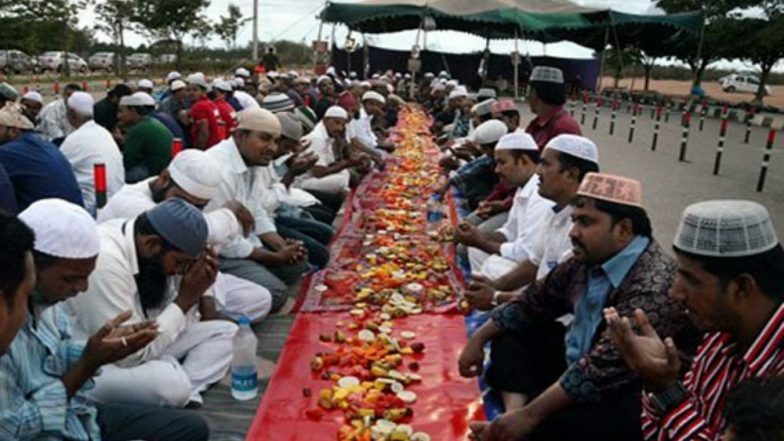 RSS Organises Iftar Party for The First Time in Mumbai, Muslim Politicians Suspect Vested Interests. "This year is very important for us here in the UAE. It is the Year of Tolerance for the UAE, 550th Year of Guru Nanak's birth anniversary, 150th year of Mahatma Gandhi's birth anniversary, 320th year of the birth of Khalsa Panth, and 100th year of the Jallianwala Bagh massacre which happened on a Baisakhi. "Keeping all these in mind, we celebrated Baisakhi to send across the message of love, peace, humanity and tolerance," Kandhari added.